This is an awesome new top of the line toy hauler that we just picked up for rent! This toy hauler includes a slide out, which really opens up the living area. The unit has all LED lighting, and even includes a dimmer for the main lights. Full Fiberglass sides, solid surface countertops, wood-look vinyl flooring, etc! This is an awesome Toy Hauler! The 28′ Toy Hauler includes a living area slide-out! The slide-out has a flip up lower floor to accommodate UTVs & RZRs loaded in the trailer. The slide out completely opens up the trailer to give room to comfortably walk past the 2 swivel captains chairs. This unit has all of the top of the line features- All LED lighting, including accent lights throughout. Main Lights are on a dimmer. The unit includes Solid Surface Countertop and Vinyl wood-look flooring. 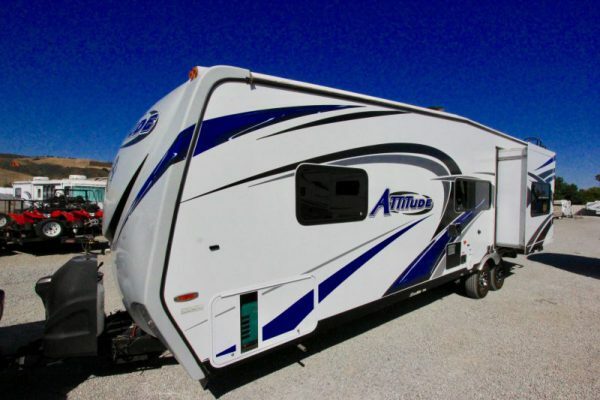 This trailer is like new, includes a front private bedroom with walk-around RV queen bed, Sofa on slide, 2 swivel captains chairs, and 2 rear beds- the bottom bed also folds up into to a sofa. 1 @ Side sofa on Slide (folds into bed) – Sleeps 7-8.